Identifying plants...what fun we can have. Website maintained and owned by Darby and Sue. There's a few things one needs to consider when chasing identification of plants when it's not known what they really are. Age and maturity, colour changes, leaf shape and edge curl and finally, the most important in many cases, what flower the plants has. During the heat of summer the intense colouring they can have during winter is, shall we say, burnt or washed out. The pics below are of the same plant ('Crinoline') taken at the peak of summer, mid season, and during an intense cold spell during winter. Stress, fertilizers, exactly where or what position in a garden or greenhouse and even what part of the country you live in can also play a part in just how much any plant might colour up or fade during the year. 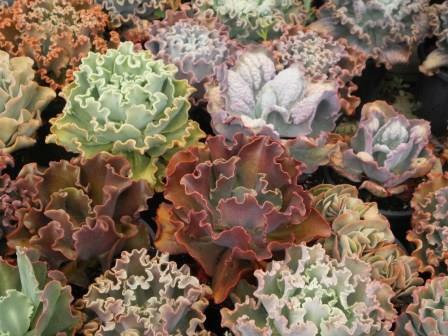 In many echeverias these seasonal changes are quite subdued to the extreme changes seen here. Below are pics of 'Silveron Red'. The youngest has no leaf edge curl on the first of the leaves formed but you can start to see it coming in the centre growth. The next one still carries the first of the leaves but the true leaf edge curl is becoming more and more noticeable. The fully mature one on the right is over 50cm, has long since dropped the first leaves and is displaying the true character of the hybrid. For the different sized rosette type all one needs to do is compare the actual shape, its colour and if possible size of the leaf. When it comes to the large frilly and carunculated plants it often pays to have a good look at the edge curl and sometimes the actual edge of the leaf. These can vary considerably and will often be a deciding factor. 'Carunculation' is the technical term for those lumpy growths on the leaf. Most (not all) of these carunculated plants will drop or lose to some extent the heavy carunculations after the deheading process and it can take some time before they return fully. Age and maturity might not matter too much when looking at the smaller growing rosette type. But some of the large frilly and carunculated plants change considerably over time and might not develop the true features for two or even three years. Pics below of E. 'Blush' show the changes as the plant ages and also gives a good example of the colour changes some plants go through during the different seasons. More often than not there is no point in comparing the flowers of the large frilly and carunculated plants. It really is the visual aspects that make the deciding factors. Flowers do become quite important in most of the other plants and can still leave one wondering for quite some time. There's also quite a bit of cross breeding echeverias with other genera that has happened in the past, it continues today, and it is only by observing the flowers that we can get any idea about this. Check the page of the different genera (Echeveria, Graptopetalum, Pachyphytum, xGraptoveria and xPachyveria) to get a basic idea of what you might need to be considering. A website created by collectors; for collectors.